I enjoy watching movies, whether in the theaters or in the comforts of our home. Movie-viewing is a perfect escape from our busy week, a great way to unwind and entertain the whole family. 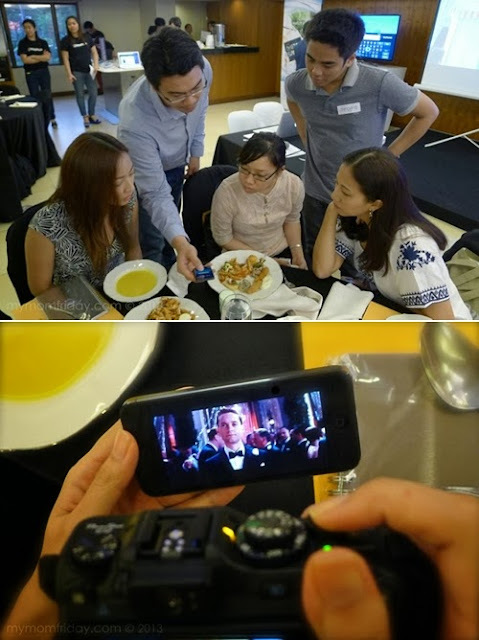 From the big screens to home theaters, from portable DVD players to videos on YouTube - there are so many ways to watch movies, and advances in technology has made it possible for video-on-demand internet streaming. 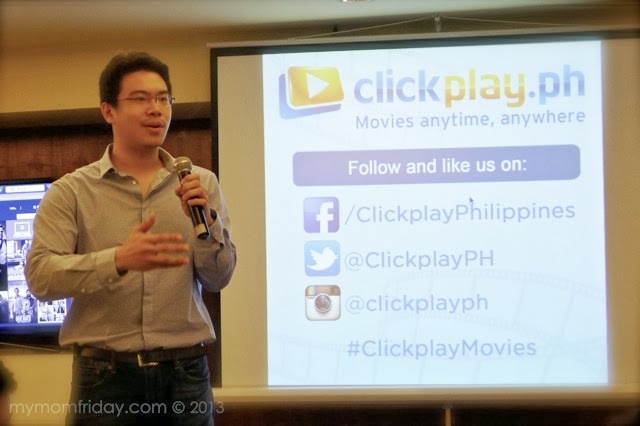 Last month, during the bloggers' launch, I was officially introduced to Clickplay.PH - the first movie-on-demand service provider in the Philippines, giving its members the ability to enjoy movies when, how, and where they want it instantly and seamlessly. Consider it the Netflix of the Philippines. "Watch movies anytime, anywhere." I love this idea, especially for the movies I missed. Now, I can watch them over and over again, whether on my laptop or even from a tablet. There were so many titles I wanted to watch, so I clicked on the star to add the movie to My Favorites list. This way, it's easier to go back and pick what to watch the next time I log in. I've already played from my laptop and, despite some intermittent buffering which lasted a few seconds each time, overall viewing was smooth and clear. It boils down to the speed and how stable is the internet connection, and the time of viewing. My overall viewing experience have been very good and convenient. I even transferred to another place, with my laptop, in the middle of my movie-watching since the kids were getting noisy at play. So how does Clickplay work? You started watching "Man of Steel" from your laptop, then you have to leave. Continue watching on your tablet, or start over from your smart phone while you're on the road. That's 3 devices playing the same movie, anytime, anywhere - as long as you have a good internet connection. Minimum speed of 1.5 Mbps is recommended. You need to install Microsoft Silverlight to be able to watch. While I was going through the steps, there was an automatic prompt for me to install so it's more convenient. 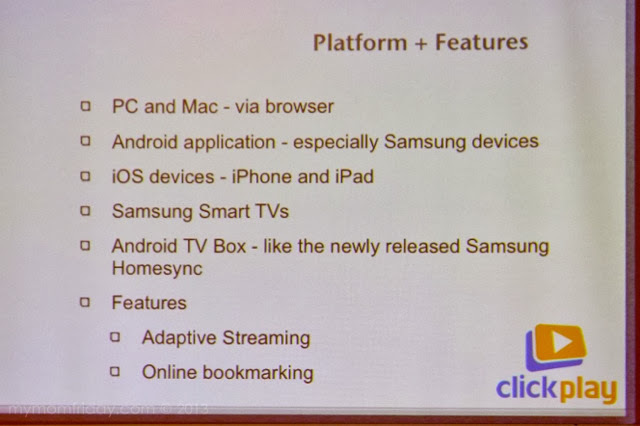 Clickplay android application is FREE for download in Google Play Store, and Samsung Apps Store. The iOS app is scheduled for release very soon! Clickplay currently offers over 200 hundred movies from Warner Brothers and Sony Pictures, with more new titles from international and local studios coming soon. You can now enjoy some of the new releases like the blockbuster Man of Steel, The Hangover 3, Grown-ups 2, The Conjuring, After Earth, The Great Gatsby, Evil Dead, Smurfs 2, Pacific Rim, and more! Subscribe now and start movie streaming online! 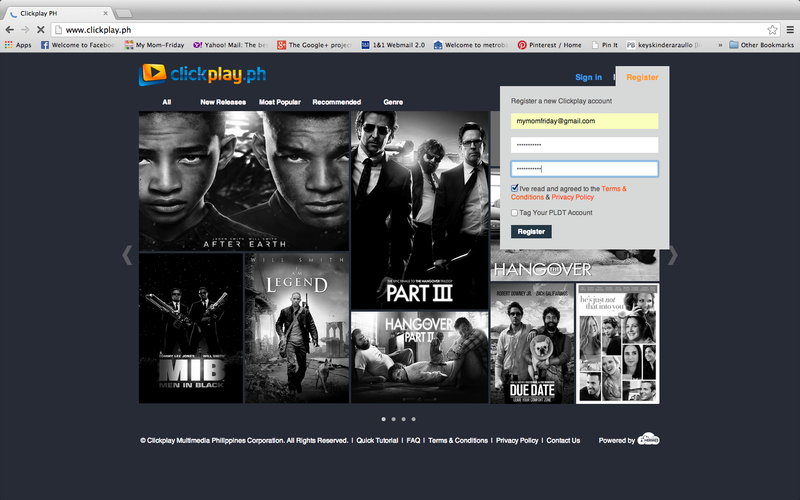 Visit www.clickplay.ph or download the app now and get ready to take the show with you. 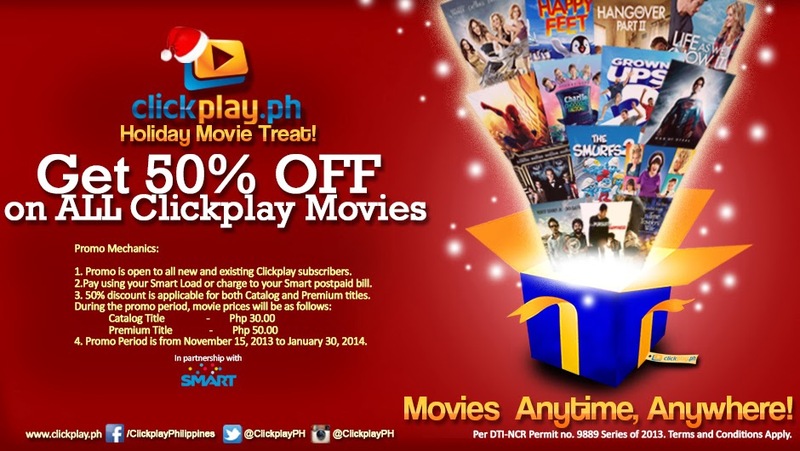 This holiday season, Clickplay is having 50% OFF on all movies until January 30, 2014! Call Clickplay at: +(632) 654-2492 or read FAQs here for more details and answers to technical and other concerns. And here's a special treat for my readers - two lucky participants will get to try Clickplay and enjoy free subscription to 20 movies over the holidays until February 2014! Raffle will close on December 2, 2013 midnight. 20 movie passes (Voucher) valid until February 28, 2014. All My Mom-Friday readers can join. Please note that Clickplay movie streaming service is only viewable within the Philippines. Voucher (prize) will be sent via email to the 2 winners once they acknowledge notification letter.